:: OnePageAfrica ::: Flee Baby Eagles, Flee When You See A Super Eagle! Flee Baby Eagles, Flee When You See A Super Eagle! The Super Eagles celebrating victory Picture Source. Earlier on Sunday, before the match took place between the Super Eagles of Nigeria and the Elephants of Cote D’Ivoire, Emmanuel Eboue boasted of how his team would roast the Nigerian team like chickens, but too bad for him, and very good for Nigeria, the Super Eagles took the shine of the match by pounding the elephants 2 goals to 1! I live close to the Teslim Balogun Stadium in Lagos and had a full feel of today’s victory by Nigeria’s Super Eagles , as football fans watching the game between Nigeria and Mali at the Guinness –sponsored viewing centre erupted with shouts of joy! I just couldn’t settle down to doing some work as the shouts of g-o-o-o-a-l rented the air each time the Super Eagles scored a goal! Inquisitively, I decided to walk out to Alhaji Masha Road and observe how the movement was on the road, I wasn’t surprised to see the place deserted, so I went back home. After the Super Eagles soared home with 3 goals in the first- half of the match, it became clear that they were out to make Nigeria proud again in football. For the second-half of the match, the Nigerian team consolidated with another goal to make it four goals! But I think they felt relaxed or decided to pity the baby Eagles of Mali when they were allowed to score a goal and dodged what Nigerians call Kondo( zero), making the final reading on the scoreboard 4 goals to 1! 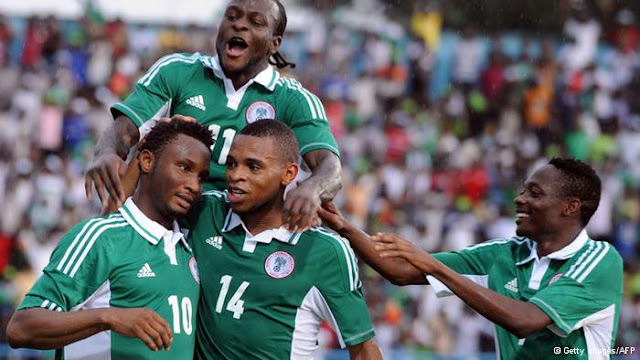 While the baby Eagles of Mali prepare to play a third-place match, Nigeria’s Super Eagles should please remain dedicated and focused on why they are in South Africa, that is, to bring back The AFCON 2013 Cup! Good work Stephen Keshi! Up Super Eagles, Up Nigeria!